Just because you installed a swimming pool, it doesn’t mean you have to empty your pockets when paying the electricity bill. There are many options for you to warm up the swimming pool and if a solar pool cover isn’t enough for you, you can always give it a go with a solar pool heater. You do need to do a bit of research before going shopping for a good solar polar heater, as you don’t want to end up with a model that is a bit too much for your small swimming pool, for instance. When we talk about solar pool heaters, we need to mention the difference between the passive and partially active solar heating options. A passive pool heater is something like a heat absorbing pool cover that warm the water and lowers the heat loss at the same time. One thing is common though as all solar power systems need somehow the sunlight, which makes them less efficient days on a cloudy day. A solar panel though works the same as a passive system, but needs a pump to transfer water from the pool to beneath the surface and back into the pool- explaining its definition as “active” solar heating system. You also need a filtering system, a manual/automatic flow control device and a thermostat in most cases. All of these active components are essential, resulting into a sophisticated system that doesn’t go cheap for sure. A solar pool heater is more efficient in some climates and it’s a great investment if you live in a temperate climate area. In the end, the question isn’t about whether you should use a solar pool heater or not, but more about how much heating you need. It’s better to stay on the safe side and get a word from a professional, as he/she knows best which system your swimming pool really needs. 1). Even if it’s not the most sophisticated nor the strongest option out there, theKokido Duomo Solar above Ground Pool Water Heater still manages to be a reliable option when you’re determined to use a solar pool heater for your swimming pool. The solar pool heater is a simple solution that uses the sun’s energy, warming up your swimming pool and keeping it that way for longer time. Even though the weather may get cold, you can still use your swimming pool when using this type of heater. The heating panel is solar so it doesn’t need electricity, which makes it both eco-friendly and cost-efficient. You may easily hook it up to your pool’s pump system and let it work. The heater draws in the water, heats it and then returns the water to the swimming pool. The solar heater is a good choice for a small, above ground pool that isn’t deeper than 12 feet. Another thing we really like about the solar heater is that it’s collapsible, which means it’s easy to store when no longer in use. Additionally, the solar heater is very easy to put together/take down. Keep in mind that the flow rate has to be less than 1,500 GPH for best results. If you’re going for larger water capacity, you should lift it into the dome shape, increasing its efficiency. Efficient and easy to use, the solar pool heater is a good choice to try. Easy to use and quite efficient, the solar pool heater serves you well, giving you a longer pool season. 2). Easy to install and to use, the GAME 4512 SolarPro XD1 Solar Pool Heater with Adapter for Intex and Bestway above Ground Pools isn’t just reliable, but also has a small footprint, which makes it so easy to find a good place for it. The solar pool heater is designed so that it can warm up the water for any size above ground pool. It’s easy to use and you don’t need any other adaptors for it. It’s strong enough to increase the pool water by 5 degrees in 3 to 8 days and this depends a lot on the size of your pool. 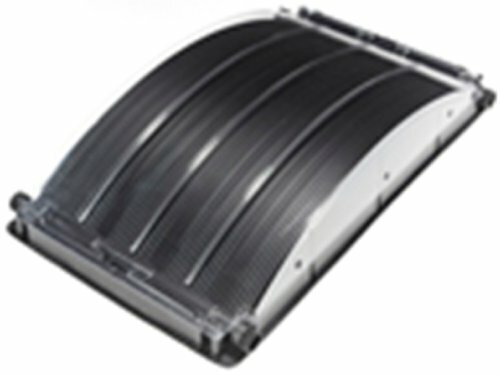 Another thing important to mention on the solar heater is its appearance. We know it’s not essential, but this one really looks nice and that counts a lot for anyone having a swimming pool. The solar pool heater is good enough for a pool that isn’t bigger than 8000 gallons. You need to get two heaters and connect them with a by-pass kit if your pool is bigger than that. We like the solar pool heater as it works well, as long as you double-check the connections. You also need a good filter system so that the heater gives better performance. 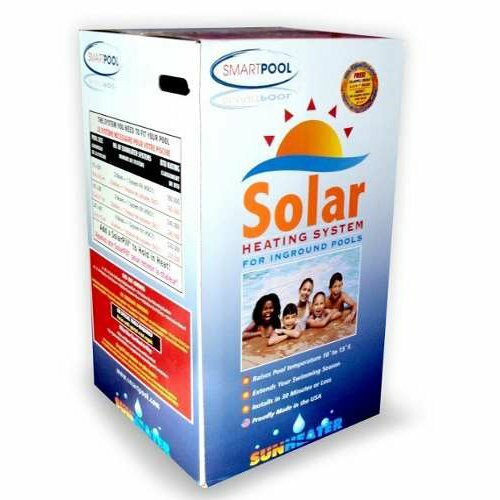 The solar pool heater is long lasting and warms up the water pool for more than a couple of summers. Regardless the minor issues, we still see the solar pool heater as a good choice whenever in need. 3). Proudly made in our USA, the Smartpool S601P SunHeater Solar Heating System for In Ground Pool is a great choice to consider, even though you may need to but separately the installation kit. The solar heating system includes in fact 80 square feet of solar panels and it’s a great tool to have for heating your in-ground swimming pool. Each panel array is 4 feet wide and 20 feet long, so it’s easy for you to know if it’s good for your pool or not. The system lets the pool water flow through each tube of the solar panels. The water is heated by the sun and returned to the pool afterwards. Your pool gets warm and stays that way thanks to this polypropylene heat collector. You may mount the system on your roof if the yard isn’t big enough to fit the whole system. The solar heating system works fine and keeps your water nice and warm even in colder days. It doesn’t leak and it’s reliable. The solar pool heater is well made and lasts for quite some time. Apart from the inherent flaws, we’d say you do make a good investment when getting the solar pool heating system. 4). Step up your game with a solar heating system like the Fafco Solar Bear Economy Heating System for Above-Ground Pools. You may find in the package 4-ft. x20ft. Solar collector, hoses with 4 clamps, bypass valve and all the hardware you need for installation. The included bypass valve lets you turn on/off the system according to your needs. The system is efficient as the pool pump circulates pool water through the already heated solar collector. The water warms up enough as long as the system gets unobstructed sunlight between 10 am and 4pm. In order to get the best results, it’s better to tilt the system 10 to 30 degrees to the South. Along with its efficiency, we also like the system for its versatility as you may easily mount it on the ground/ rack or a close roof. The system is made of UV stabilized polyethylene that means durability and power, even in case of intense use. The included hoses and the four clamps let you hook the system to your filtration system, for better performance. As long as you’re following the instruction from the user manual, you’re not gonna find the installation very complicated. The system is easy to set up and has a durability feel attached to it. The material is tough, durable plastic and the system is made to last more than one summer. Focusing on the bright side, we see an efficient solar pool heating system that isn’t difficult to install and does its job for more than a summer. 5). 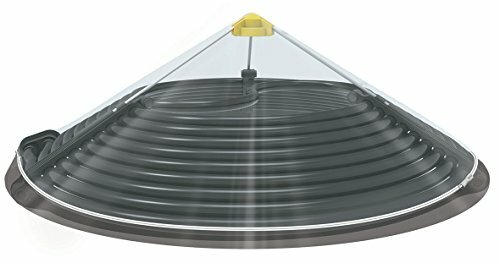 When you take a look at the Smartpool S204 the Solar Arc Pool Heaters, its unique design may strike you at first, but the solar pool heater is more than just interesting appearance. The solar pool-heating unit has a compact, curved design that gives it a smaller footprint. This way it’s easier to display it and to store it as well. 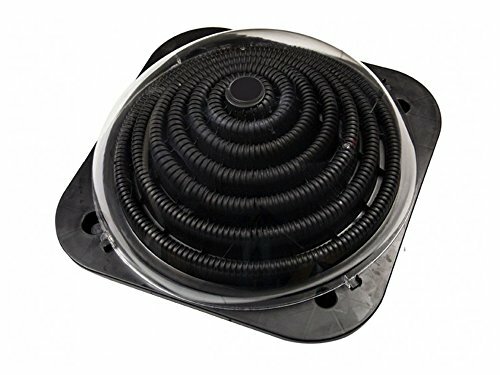 You may easily install the solar heater directly in line with your current plumbing as its high-flow design vanishes the need for a by-pass kit. The pool pump simply pumps water through the unit’s curved tubes, warms the water and returns the water to the pool in the end. The well thought out design doesn’t stop here and the unit features built-in legs so that you may place it to the best angle, getting the best sun penetration. The unit also comes with hose fittings and Intex adaptors, becoming more versatile. 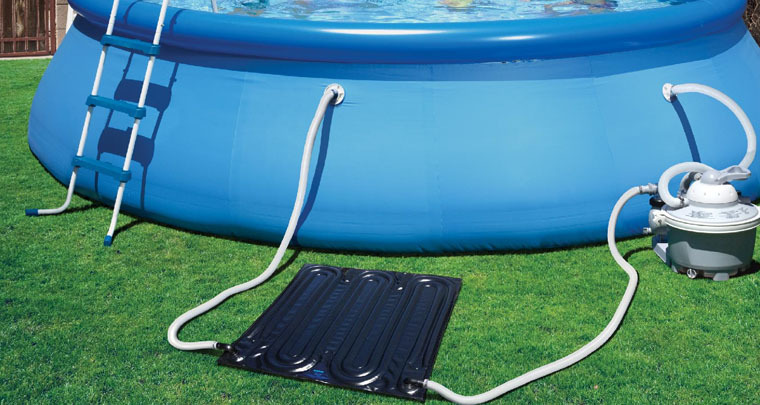 Its versatility doesn’t stop here and you may easily use the unit for in-ground and above ground pools also. Small, compact, easy to install and cost-efficient, the unit surprises with its performances and its smart design. It’s lightweight and easy to carry around. On top of everything else, the unit is made here in our USA, which is always a great thing. Nevertheless, for the smart design, small and compact shape, the solar pool heater is definitely a “yes” when going shopping.